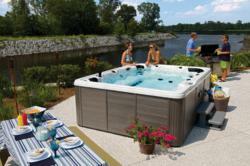 We always knew that hot tubs were a great place to relax with family and friends, and to get a heavenly, soothing massage, but research shows that they are also good for your health, helping fight off serious diseases like hypertension and diabetes, according to hot tub specialists Waterstream Hot Tubs, regional distributors for respected American hot tub manufacturer Spa Crest Hot Tubs. The UK has seen a huge rise in numbers diagnosed with diabetes, rising from 1.4 million in 1996 to 2.9 million today. Estimates suggest that over four million people will have diabetes by 2025 with most cases being Type 2 diabetes, due to the rise in the numbers who are obese and an increasingly ageing population. More than ever there is an acute need to find ways to combat type 2 diabetes. According to a report in this week’s ‘The Guardian’, the newspaper of the University of California at San Diego, results of numerous studies catalogue the positive health benefits of regular hot-tubbing, in particular Dr Philip Hooper noted in a 1999 article in the New England Journal Of Medicine that tests on diabetic patients showed significant reductions in blood glucose levels, after only three weeks of hot tub bathing for 30 minutes a day, 6 days a week! In 1962 in Pavia, Italy, Ferruccio Ritossa accidentally discovered the ‘heat shock response’, while studying molecular genetics. A fellow student increased the temperature of his drosophila (fruit fly) incubator to higher than normal. When Ritossa examined the drosophila cells, he noticed changes in a way that makes DNA more accessible to be copied, or transcribed, which he discovered was being caused by the increase in temperature. Last year, Drs Virginia Vega and Laura Alexander from UCSD demonstrated that the heat shock response improves the condition of non-obese diabetic mice. Coupled with other benefits such as a reduction in blood pressure, reduced weight due to buoyancy, and lowered stress on the joints, Alex Kemsley, managing director of Waterstream Ltd based in Handcross nr Gatwick says that the public are welcome (by appointment) to bring along their bathing costumes so that they can try out the superb Spa Crest range at their showroom to experience the benefits for themselves. And best yet, because they recirculate and filter their water, hot tubs are exempt from the hosepipe ban!